I have been offering Reiki drum treatments for a while now, and I am often asked about them and their effects. The Reiki Drum technique combines Reiki, a system of energy re-balancing that stimulates the body’s natural ability to heal on a mental, emotional, physical and energetic level with Drumming, an ancient Shamanic style ritual using a drum beat, to carry the Reiki into the body’s energy field. It creates an incredible sense of deep relaxation and helps the brain into an ‘alpha state’ with brain waves associated with well being and joy. Scientific studies have shown that drumming, or listening to the sounds of drumming have remarkable effects on the human body physically. Studies have shown that it can affect the brain, boost endocrine and immune systems and helps to bring about a sense of peace and relaxation, created by the balancing of blood pressure and cortisol levels and an increase in endorphins, reducing pain and increasing well being. Studies have also shown that it can increase the number of the natural killer cells inside the body boosting the immune sysytem. Rhythm is a natural thing for the human body to experience, we are after all created inside our mothers bodies, and we grow and develop listeining to her heartbeat for the first nine months of our lives. The heartbeat rhythm is still one of the most soothing sounds to any of us. Differing rhythms create different responses in the body, they can soothe and relax or invigorate and uplift. On an energetic level, the vibrations of the drum ( which you can feel throughout your body during a treatment ) encourage mental, emotional and energetic balance and well being, helping our consciousness to shift and to bring about harmony in our bodies on every level possible. Reiki Drum treatments can be used in the same way a reiki treatment would be, for general well being or for physical, emotional or mental well being. 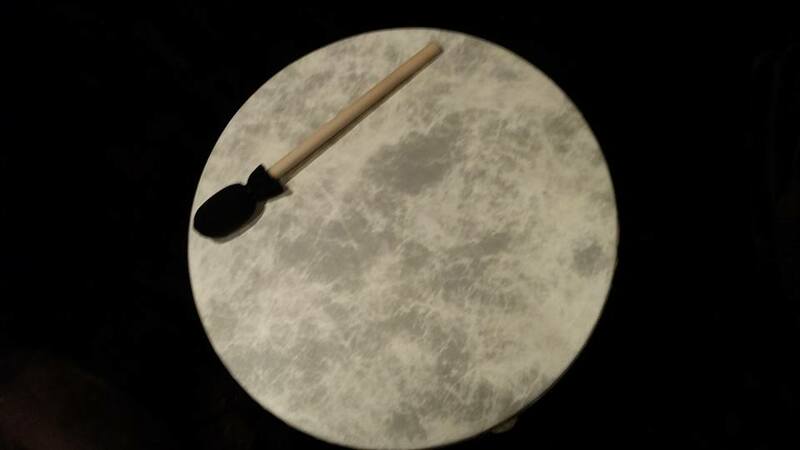 Reiki Drum also offers something quite special and unique, a Reiki Drum Journey. This can be used in two ways, firstly as a therapy to be guided back in time to a point where you felt afraid or uncomfortable and the reiki energy can re-balance this and help to realign your subconscious into transforming the energy into loving and positive vibrations. This has a domino effect on your subconscious and helps to heal past hurts bringing positive energy right back up to the present day in your life. It’s like a waterfall of good vibes from past to present. Secondly you can use a drum journey to meet a guide or a power animal or receive an answer or clarity to a question or situation you may need help with. Its a guided meditation process using a drum beat to help your brainwaves reach a relaxed state and to help you with your journey. Its a very simple but highly effective therapy and really popular with my clients, especially the ones who like to try something new. It also has quite powerful effects, particularly on a subconscious level, helping to remove subliminal blocks to people moving forward and progressing with their lives. You can have a reiki drum treatment or a drum journey for specific reasons or just as a relaxing experience, it will always have a beneficial effect whatever the reason. If you have yet to experience the power of the drum, then I suggest you try it, you’ll be pleasantly surprised and I guarantee it will help your general well being. Thankfully I don’t have neighbours so I can drum away to my hearts content!